When we were adopting out the Shadow Pups, people naturally wanted to know what kind of dogs they are. Unfortunately, I didn’t have any real answers to give them. Eurydice is obviously a German Shepherd mix, and her blocky skull means there might be some pit bull in there, but aside from that we just didn’t know. I based all of my guesses about their breed(s) on the dogs I’d seen running around with Eurydice around the time she would have gotten pregant. I’d seen her with a gigantic Mastiff – I mean, this dude was a two-hundred-pounder for sure – and with a lanky reddish hound that looked like a Vizsla mix. 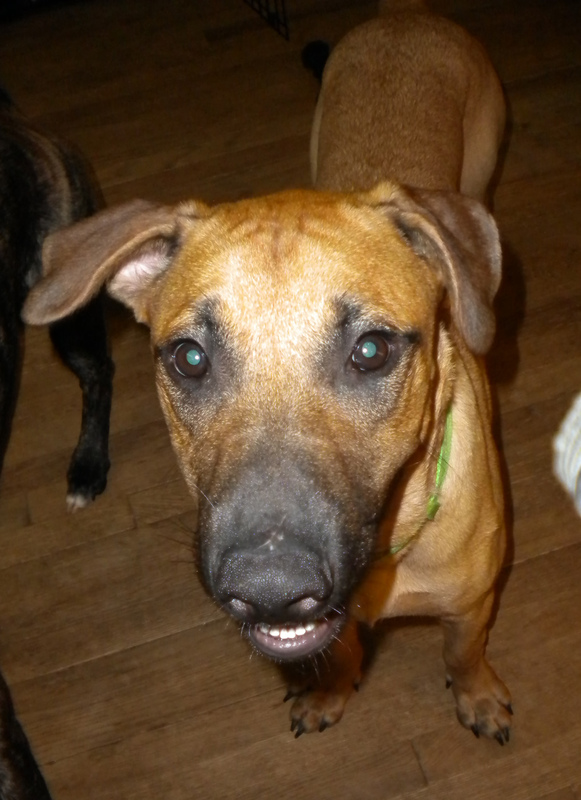 Image searches for both Shepherd+Mastiff mixes and Shepherd+Vizsla mixes revealed lots of dogs that looked like our puppies, so that’s what I told people. 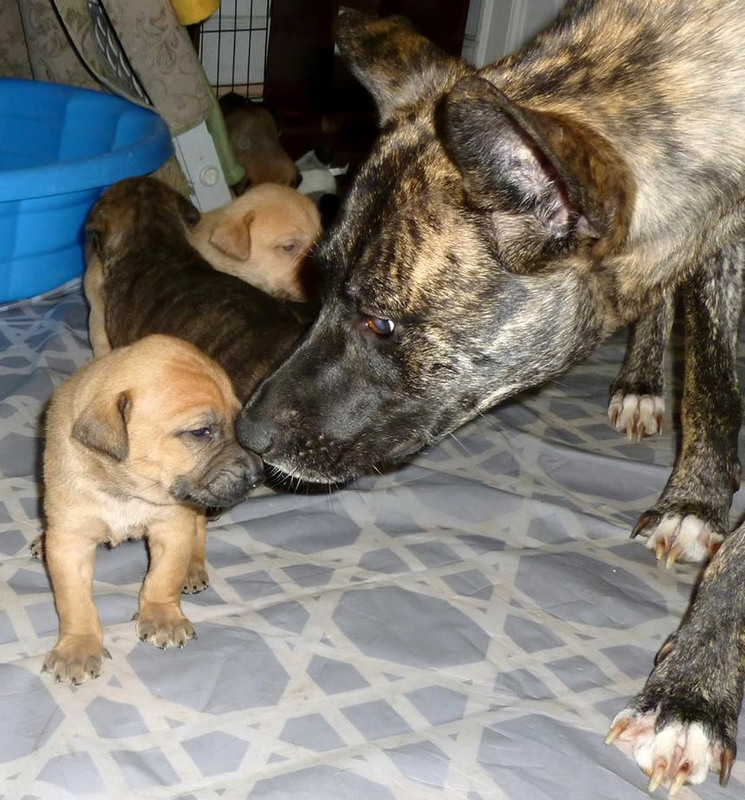 Hermes’ new family was so curious about their giant stripey puppy’s family history, they sprung for a DNA test. The results came back on August 11th and they graciously shared the information with us. Turns out, I was way off. Eurydice appears to be a 1/2 German Shepherd, 1/4 Staffordshire Terrier (closely related to the pit bull), 1/4 Bulldog mutt. Papa Doggo was a 1/2 Rottweiler, 1/4 Staffordshire Terrier, 1/4 Shar-Pei mutt. One of the other adoptive parents had suggested Shar-Pei because of their wrinkles, but I mostly dismissed it at the time; Mastiffs and Vizslas often have wrinkles, and it didn’t seem to me like these pups had those signature Shar-Pei folds. Like I said: way off. 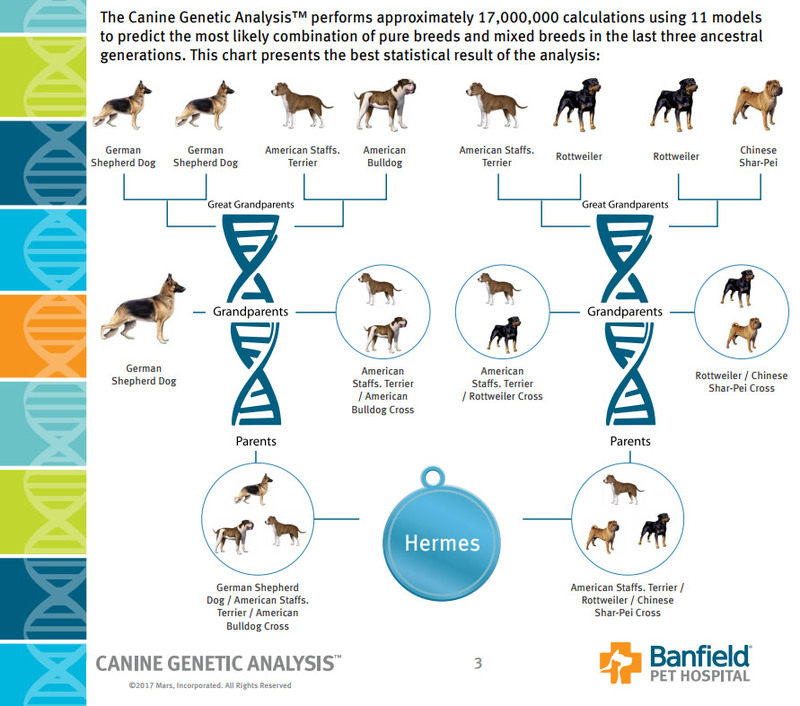 Canine Genetic Analysis™ provided by Banfield Pet Hospital. The good news is these breeds all make wonderful family pets. The bad news is, the traits they were bred for – extreme devotion to the pack (even for dogs) and protective behaviors – can lead to severe anxiety problems if not properly channeled. We got Hermes’ DNA results on the 11th. On the 9th, Aleph’s adoptive parents contacted me to ask if we would take him back. He’d developed extreme separation anxiety, to the point where he’d start tearing up the house, even hurting himself in the process, if he was left alone for even a few minutes. Some of his stress was due to inconsistent training on their part; that, paired with his genetic tendency toward anxiety and his mother’s high-stress life on the street during her pregnancy, meant poor Aleph was almost guaranteed to act out. Of course we took him back. I picked him up on the 14th. He didn’t seem to remember me, but he got into the car willingly enough. He cried for his owner for the first few minutes, until I began to sing the Puppy Monsters song. This is something I started singing to the Crystal Pups when I was ready to start chucking ’em out the window; it kept me from screaming at them (and undoing weeks of training) during difficult times, and it gradually became a signal to them that it was time to calm down. Why are puppies so monsters? Why are you so monsters all the time? Puppies, don’t you know you’ve got me cryin’? That’s it. That’s the whole thing. Sing the verse, repeat, repeat, repeat, until the dogs start to settle down. Maybe pet them if you aren’t, say, driving at the time. Let them know the song’s over by adding cha-cha-cha! at the end. I gave it a shot, hoping it would calm Aleph a little bit. When I started on the third repetition, he stretched out in the back seat and relaxed. Every time I stopped, he’d freak out again. I sang that damn song for the entire drive home. A fender-bender had shut down traffic on a long stretch of the freeway, so a half-hour drive became an hour-plus drive…by the time I got back, my voice was shot. Not the best way to start a day I’d have to start retraining a 70-pound dog, but it kept him from wailing all the way home so I was pretty pleased overall. Aleph has reintegrated into our pack easily enough, but his separation anxiety is pretty extreme. I closed him in my office – with plenty of praise and toys and treats – as a test a few hours after we got back, and after giving him a chance to see me close the other dogs in there for ten or fifteen minutes each so he’d know it wasn’t a punishment or some kind of torture reserved for him alone. I wanted to see how long he could stand to be alone. The answer? Approximately 45 seconds. That first time was at the end of a stressful day, so I’ve been trying the same tack a few times each day since. He’s up to approximately a minute. We have some work ahead of us, Aleph and I. It’s pretty well-established that, just like humans, dogs can suffer the effects of being born to mothers in extremely high-stress situations even well into adulthood. But there are some training techniques that can reduce his natural anxiety; and now that I have some insight into the breeding that might be contributing to this, I can further tailor his training. Aleph at 4 weeks. He’s always been a Mommo’s boy. Aleph on the day of his return. Don’t worry, buddy: we’ve got this.